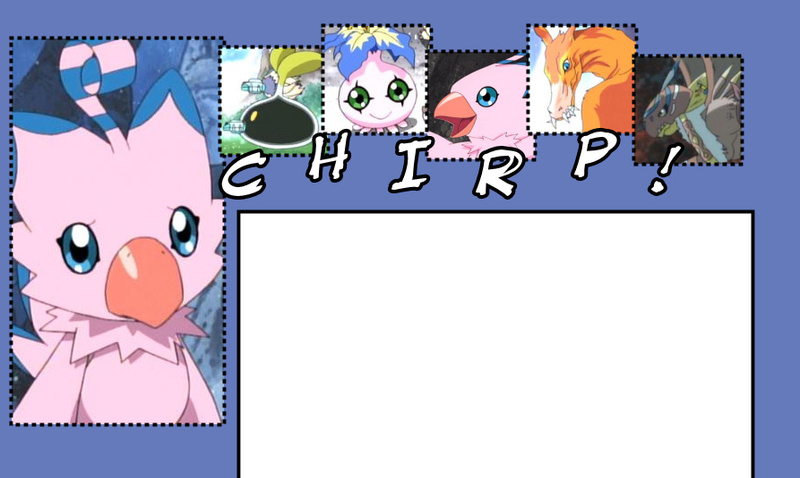 WELL, LET'S SEE... from the moment I first saw Piyomon, I thought I was going to like her, since I've been a fan of cartoon birds my entire life. When I finally got to watch Digimon Adventure first-hand, she quickly became my favorite character. I tend to get my favorite characters randomly - there's a huge variation in characters I like, from angsty and complicated ones to happy and easy-going ones, but if I WERE to go after a specific personality type, I'd most likely choose the latter. I'm all for world peace and kindness and all that lovely crud, so it's only natural for me to take a liking to optimistic and loving characters like Piyomon. I think what draws me to Piyomon the most is her tendency to love everybody, and her clinginess and extreme obsession with Sora. She's just a really fun character to watch, and it's very interesting to observe the developing relationship between her and her insecure human partner. I adore how Piyomon is always so cheerful, naive and full of life, yet she knows when to get serious! She always puts her friends before herself, which is always a very admirable personality trait. I'm very fond of her entire evolution line - like I said before, I've always loved cartoon birds, and I find it interesting how she evolved from a little seed thing into a bird. Garudamon is especially noticeable - she's big, burly and manly on the outside, but still a lady on the inside!